Los Angeles is a treasure trove of neighborhoods to explore, sights to see, food to taste, music to hear, people to meet, and so much more. The sprawling nature of the city accompanied by the endless traffic make every moment precious for visitors, especially those on a tight schedule. Here is a perfect 72-hour itinerary put together from years of research and experience to guide anyone through the best 3-day period in Los Angeles. If you have any questions or would like advice on how to adjust for your own personal interests please feel free to email me at wineanddinewalkingtours@gmail.com. 8:00am Start your adventure with breakfast and coffee from a local coffee shop. Every neighborhood has their own local cafe's and each is certainly worth a visit! In my neighborhood (Valley Village/North Hollywood) I have two go-to’s for morning coffee and pastries: Steampunk Cafe and Lilit Cafe. Both have very different environments, but each is equally awesome in their own way. If you aren’t staying nearby, don’t worry, whatever neighborhood you are staying in will also have a cute morning stop! 9:00am Head to the coast to soak in the California beaches! Start by going to El Matador State Beach. This beach has dramatic cliffs and beautiful natural caves. The parking lot fills up fast so getting there early is key. If you choose to street park instead, make sure to read the parking signs to avoid tickets! 11:30am Lunch time! Head south down the Pacific Coast Highway (PCH/The 1) and pull off at the first grocery store you see. Pick up some picnic supplies and make your way to Malibu Wines. For my picnics at Malibu wines I usually bring a lot of cheese, fruits, and maybe a sandwich from the grocery deli if you are feeling particularly hungry. You are allowed to bring in outside food, but no glass or outside alcohol. (MUST BE 21 TO ENTER, MUST SHOW VALID ID). Not in the mood for wine (GASP!) or not all of your travel companions old enough to enter? No worries! There are plenty of cute restaurants down the PCH. Some personal favorites are Moonshadows Malibu (less expensive, more casual tiki-hut style dining) and The Sunset Restaurant (More expensive, more upscale experience with great food and lovely views). 12:30pm Arrive at Malibu wines. Enjoy your picnic and a bottle of wine. Be sure to ask for a tasting if you cannot decide on a wine! 2pm Now that you have enjoyed your lunch it is time to hop back on the PCH and keep moving south to Santa Monica! There are a few parking garages in Santa Monica, but you can also park on the pier for the same price if it is not full (at 2pm on most days it should not be full). 2:45pm Once parked head straight for the iconic Santa Monica pier! The pier itself is lovely (and definitely worth a stroll), but Santa Monica has a lot more to offer. If you are in the mood for shopping go to the Promenade! There is a paved walkway along the beach that leads straight to Venice Beach, too! Walk down to Venice and back (about four miles round trip) or rent a bike and coast along the bike path! (Fair warning, while walking along the pavement is lovely during the day, it fills with some questionable characters after dark, proceed with caution- or even avoid altogether after dark). 6pm HAPPY HOUR! If you’re still in Venice then the curb appeal of the The Venice Whaler is almost too much to pass up, especially right around sunset. They have an awesome happy hour so head on in! MUST BE 21 TO ENTER! If you don’t stop at The Venice Whaler, don’t worry it is hard to go wrong with any place that has a sunset view; so think beachfront for dinner! Still in Santa Monica? Good! Check out Ristorante Al Mare for happy hour and an aerial view of the pier! This place is very underrated and often fairly empty. You can have the rooftop almost to yourself some evenings! Mariasol at the very end of the pier is also a fun choice, but often has a wait and slow service. 7:30pm It’s been a long day, but before you head home go to The Bungalow Santa Monica for a night cap with some awesome views! If it is summer then you’ll be here in time for the sunset! 9pm Time to head back to your hotel. It has been a very long day, so rest up for tomorrow! You’ve only got 48 hours left and we’re going to make them count! 8am Grab some breakfast and coffee because we’ve got another big day ahead! 9am Book tickets to a Warner Brothers Studio Tour (tickets must be booked in advance)! Morning tours usually start around 9:30am. It is a good idea to do the tour early in the day (especially during the summer) to avoid the afternoon heat! 12:30am Head to Los Feliz for some very cute lunch spots. Some of my favorites are Little Dom's (very tasty Italian) and Alcove Cafe (fun patio to sit and enjoy the neighborhood). This will put you closer to the Griffith Observatory, which is where we are headed next! 1:30pm The Griffith Observatory is a great stop for an afternoon hike and some sweeping views of the city. The observatory itself offers plenty of vistas and entertainment within. You can hike to the Hollywood sign from here (I don’t recommend this as a starting point for that hike; it is very long) or just hike around the observatory for some amazing views. If you do want to hike to the Hollywood sign I would recommend following any of starting points and paths mentioned here. 3:30pm Once you have taken in everything Griffith has to offer it’s time to soak in Hollywood. Try to park or arrive near the Hollywood and Highland intersection. Street parking is available, but can be a bit overwhelming in this area. There are a few parking garages nearby that might be a better option, or you could even consider taking your car back to your hotel and taking Lyft’s or the Metro for the rest of the day (depending on where you are staying). 3:45pm After parking and/or arriving head up the stairs of the outdoor mall area. If you go straight to the back you will have a great view of the Hollywood sign! It is always fun to watch the tourists shopping, snapping photos, or even playing in the fountain! 4pm Walk next door to TLC Chinese Theatre. Explore the handprints and see how many names you recognize! 6:30pm Once you’ve worn yourself out on Hollywood it is time to move one neighborhood over, to West Hollywood, for dinner and nightlife. Stop in to SUR for appetizers during happy hour and get a chance to see some of your favorite stars from the shows The Real Housewives of Beverly Hills and Vanderpump Rules. For dinner try Gracias Madre for some vegan mexican food with tons of Los Angeles flair. Not in the mood for mexican (or vegan)? Try E.P. & L.P. for some asian fusion and an incredible views from the rooftop (be prepared for slow service! This place is notorious for it, but the views make up for what the service lacks). If neither of those options sound good then try literally any of the other hundreds of restaurants around you. West Hollywood has become known for its amazing food scene. After dinner check out The Abbey Weho to truly soak up the culture of West Hollywood. Pour Vous is also a personal favorite. Sit at a swanky bar enjoying a perfect cocktail and late night crepe. Just when you think it couldn’t get better the ceiling opens up and burlesque dancers perform in the air above you! Truly an LA experience! 9:30pm (Or whenever you're ready to call it a night) Before leaving West Hollywood head to the LACMA to see the Urban Lights display. As LA’s number one most instagrammable spot it would be a shame to miss! Make sure you get plenty of rest because you’ve only got 24 hours left and you don’t want to waste a moment! 9am Coffee and breakfast wherever you want! 10am Arrive at the The Getty Museum (free entry! $15 parking if you choose to drive). You definitely want to arrive early to beat the crowds! This museum is massive. I have been over ten times and still have not seen everything there is to see. 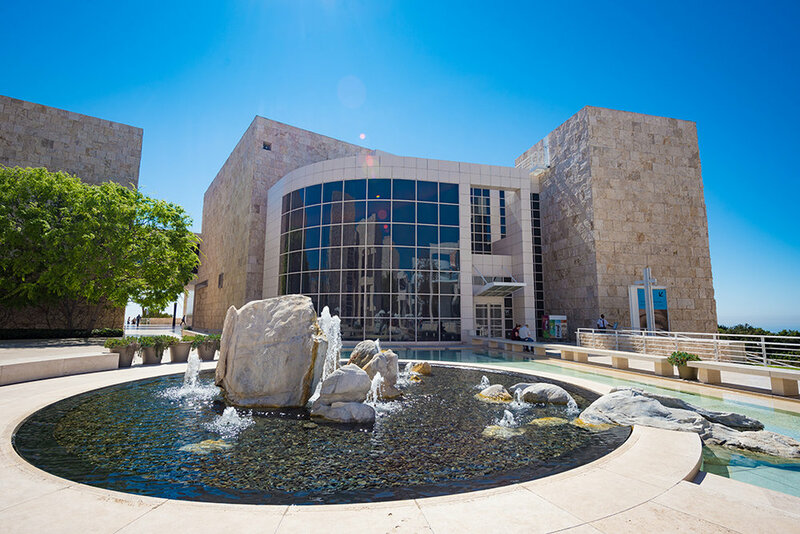 I would do a little research into what The Getty has to offer and plan to visit just a few areas that interest you. The garden and the views from the back end of the Getty are must sees! 12:30pm Lyft or Uber to Grand Central Market in Downtown Los Angeles for lunch. This market has rows and rows of vendors offering a large variety of foods from around the world! I have yet to be disappointed by any of the food here. 1:45pm After eating, walk across S Broadway to the Bradbury building. The bottom floor is open to the public and worth a visit! Inside are an amazing collection of wrought iron staircases ascending into a glass ceiling. It is an architectural masterpiece! 2:45pm After taking in the amazing views of the city, go back down the elevator and make your way to Olvera Street. This street is one of the most historic sections of Los Angeles. Though the street has been a bit “disney-fied” in recent years, while walking down Olvera Street you will feel transported out of the city completely. Take time to look at the plaques on the buildings, statues, and in the square at the end of the street for quick information about the founding of Los Angeles. 3:45pm When you are done with Olvera Street, walk across the street to Union Station. Explore the hallways and fascinating history (again- read the plaques!) of this train station; there are some fascinating history facts about this building. 4:20pm Once you’ve finished exploring Union Station hop on either the purple or red line (follow the signs inside Union Station) and take it to Pershing Square to meet for a food and wine walking tour (must book in advance)! The city center has so many great restaurants and bars to visit. By taking a walking tour you don’t have to choose which to visit! 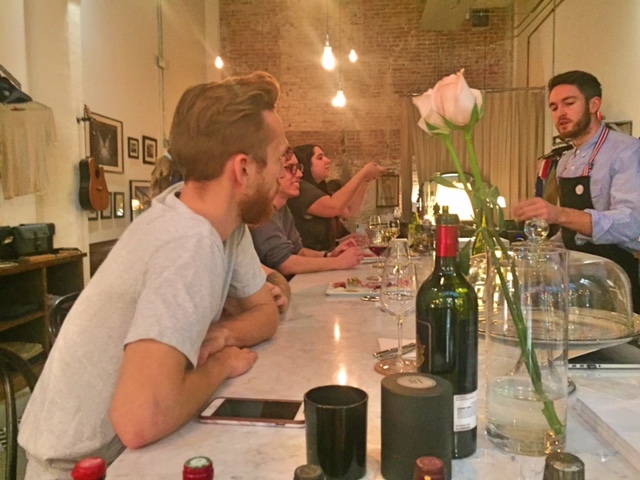 Wine and Dine Walking Tour is the best option, because guests not only get food AND wine, they will also get to see a few other sights around the city! 8:45pm After your walking tour is done, if you still have more energy, head to a rooftop to see some lovely nighttime views of Downtown Los Angeles! Some of my favorite rooftops are Perch (this is an upscale french restaurant with dazzling views! Go all the way to the rooftop for the best view and a drink) and The Standard Rooftop Bar (the drinks are very average here, but the views beyond make up for it! Make sure the check out the poolside waterbeds after you purchase your drink from the bar- MUST BE 21 TO ENTER). This whirlwind three days is sure to leave you feeling well acquainted with Los Angeles. If you have any questions about this sample itinerary or would like other recommendations based on your own interests please reach out via email (wineanddinewalkingtours@gmail.com) and I’d be happy to help! If you have more time in the city, don't worry there is PLENTY more to do! I love this city and I want to make sure you leave loving it, too!